Suka Nulis Esai? Yuk Daftar Beasiswa DataPrint! Tahun ini DataPrint kembali bagi-bagi beasiswa lho. Syaratnya mudah, apalagi bagi kalian yang suka menulis. Yak, syaratnya adalah menulis esai, mengisi formulir, dan menyertakan kode yang terdapat di dalam kemasan produk DataPrint. Beasiswa akan dibagikan kepada 500 orang. 100 orang akan mendapatkan masing-masing Rp 1.000.000, 100 orang lagi akan mendapatkan masing-masing Rp 500.000, dan 300 orang akan mendapatkan masing-masing Rp 250.000. Aplikasi beasiswa dibuka sepanjang tahun dan dibagi ke dalam dua periode. Periode pertama 10 Februari hingga 30 Juni 2015. Periode kedua 1 Juli hingga 25 Desember 2015. Untuk aplikan yang merupakan pelajar SMP dan SMP, tema esainya (untuk periode kedua) adalah "Gadget sebagai media penunjang belajar mengajar". Dan untuk aplikan yang merupakan mahasiswa D3/S1, tema esainya adalah "Sikap untuk meningkatkan SDM Indonesia agar sejajar dengan negara maju". Banyak kali, ketika saya mengisi ulang bensin motor di berbagai SPBU, sang petugas SPBU menumpahkan beberapa tetes bensin saat mencabut selang dari tangki motor. Menurut saya, seharusnya selang dibiarkan beberapa detik dulu sampai semua minyak masuk ke tangki, sehingga tidak ada yang tercecer percuma. Selain itu, tidak jarang petugas SPBU memasang wajah cemberut dan berinteraksi secara tidak ramah dengan pelanggan. Bagi saya, mereka kurang memahami tentang bagaimana seharusnya melayani pelanggan. Ketika saya di Thailand, petugas SPBUnya sangat ramah. Saat pelanggan datang, mereka bertanya dengan ramah berapa pelanggan mau isi tangkinya. Bahkan ketika beberapa kali saya kesulitan membuka tangki motor sewaan yang kebetulan berbeda dengan motor yang saya pakai di Indonesia, mereka dengan sigap membantu membukakannya. DuoLingo. You can learn many kind of languages, from Spanish to Swedish, English to French, through game-like method, which cover vocabulary, grammar, listening, and speaking skills.Zenius EnglishBBC Learn EnglishRadio AustraliaLanguage Pod 101. Like DuoLingo, LanguagePod101.com also offers many kind of languages, but use different learning method, which is mainly uses YouTube video tutorial. Learn English with Mr Duncan Hope you good luck on learning new languages! I have learned English since I was in junior high school, yet my English skills are not very good. I even just started to speak English regularly when I come to Thailand for exchange program. Before that, I was so afraid to speak, afraid of making mistakes. From living abroad experience, I just realized that language skills are just a matter of practice. If we use the language frequently, then we'll be better and better on that language. So, the greatest difficulty on learning new language in my opinion is the hesitation of practice. It will be my advice for someone who want to learn new language (and for myself too): practice more, use more! "Writing is easy. Becoming a writer, especially fiction writer, is a very easy job. You can write anything you want. If you stuck, just stop, finish the story. All is up to you." For sure, writer's job is not easy, and what Tere Liye said is more an attitude than reality, for me. But, as I think about it, I realize that attitude can define the reality. As I do regular writing lately, I try to think that writing is easy. And that's what I get. As we think something is easy, it could turn out to be real easy. So, why not make everything easier today? Pritil brambang is the daily job that some of my neighbors (in Banyuwangi) do everyday. Mostly by women, but sometimes their men help. Brambang is red onion, and pritil brambang means removing the red onions from its thicket, manually with hand and cutter. The women can work all day and night, literally, from early morning around 8 am until 8 pm. Even now, the clock shows 8:34 pm, while I'm writing this blog, they're still doing their job. Although their job seems very hard to me, but they never looked stressed. Instead, they looked relaxed, cutting the red onion with hand moving in high speed while talking each other about anything. Today is a big day for Muslims, because we are celebrating Maulid Nabi Muhammad (Prophet's birthday). 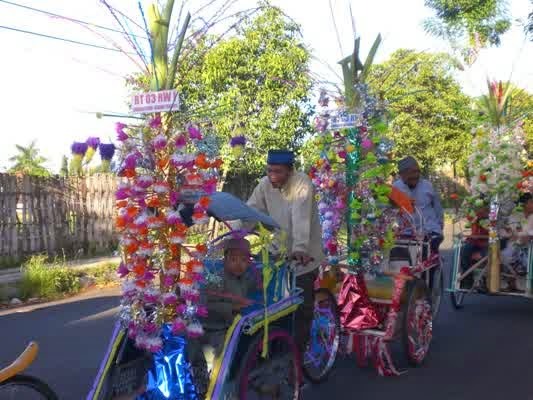 In Indonesia, particularly in my city Banyuwangi, we have a special event called Endog-endogan. Endog is local language means egg. In this day, Muslims households give foods and (boiled) eggs (decorated in many ways, like egg tree from banana tree) to local mosque. In the morning, people come to mosque, pray firsts, and then the foods distributed to them to eat together in the mosque. Tonight, I visited my friend's home, as we usually do in each semester break, to visit each other when we come back home from university. He is a good old friend, we have been friends since primary school, first met in a competition event in our regency. That time we only knew each other because we were in different subject of competition, he was in drawing, I was in natural science. But since we got to the same junior and senior high school, then we became closer. So, our friendship has last for more than 10 years by now. I still remember 4-5 years ago in high school he helped so many times in my art homework. And then 3 years ago we were in the same preparation course to get into university. We studied really hard together which was really fun. And now, he's preparing his thesis for graduating next semester and will continue study one more year for graduate degree.